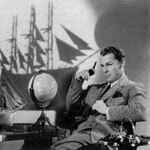 Starring Brian Donlevy as Steve Mitchell, Dangerous Assignment was an adventure, international espionage series debuted during the Cold War years. Broadcast from 1949 to 1953, the series was a product of the anti-communism movement. Steve Mitchell was commissioned as an agent for an unidentified U.S. goverment agency. Herb Butterfield played Mitchell's boss, the nameless Commissioner who assigns Mitchell to tasks around the world. Betty Moran portrayed the Commissioner's secretary. This action-packed story is narrated in first person present tense from Mitchell's perspective. The plot often involves Mitchell's being dispatched to exotic hotspots around the globe where trouble awaits him.